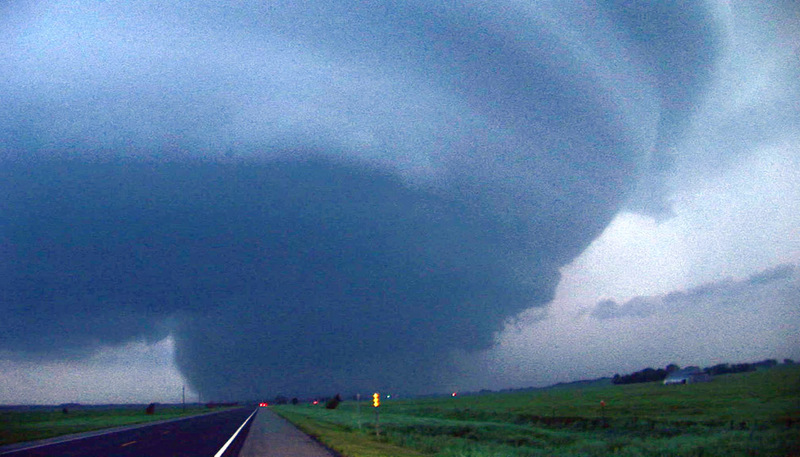 storm video, chase images and log by William T. Hark, M.D. 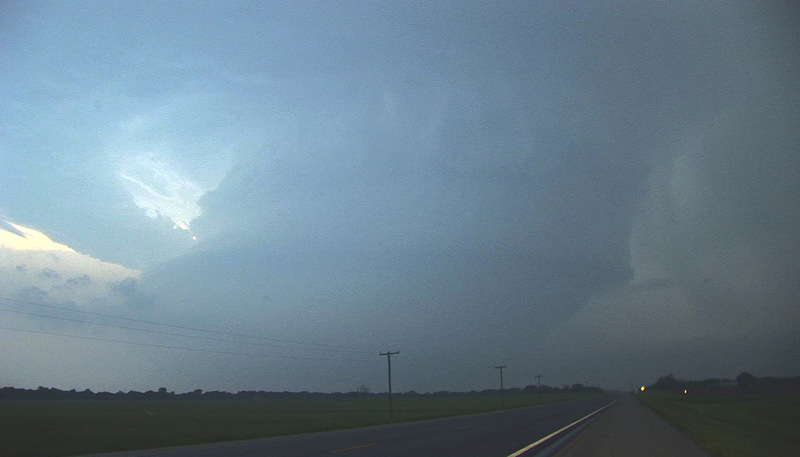 May 29th was a very exciting and difficult chase. 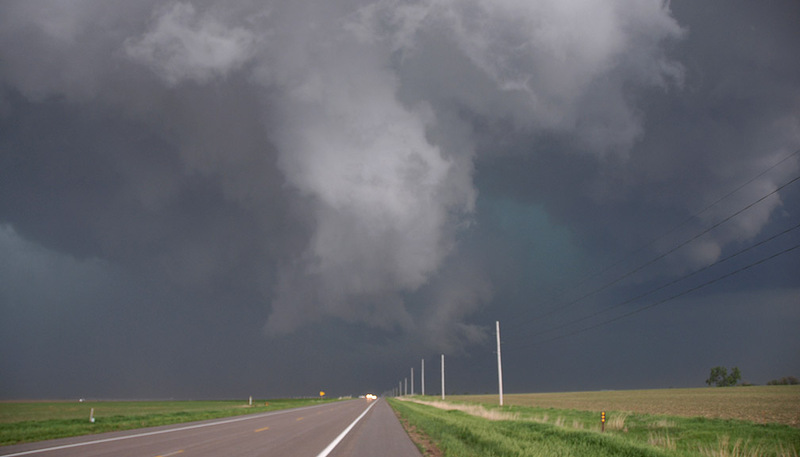 Although I didn't get close video of the tornadoes, I did observe a magnificent classic supercell and multiple distant tornadoes including a massive wedge tornado. I started the day in Wichita, Kansas. After reviewing data early in the previous evening, I decided that May 29th would be a good setup for severe storms rather than tornadoes. I was mainly concerned about the 850 mb winds being veered along with lack of moisture return. I decided to schedule an early flight home. I should have listened to Charles Edwards who was bullish on the probability of good storms that evening. The next day, I analyzed more data. The Storm Prediction Center had issued a high risk for northwestern Iowa and eastern Nebraska. The moderate risk extended to northwestern Kansas. I was still concerned about the 850 winds but everything else was coming together for a major tornado outbreak. I rescheduled my flight and headed north from Wichita. I couldn't miss this opportunity. Forecasting this event was difficult. I initially had two very different targets based on the position of the surface low and warm front: northeastern Nebraska and Colby, KS area for dryline storms. I was getting very different results depending on the forecast model. 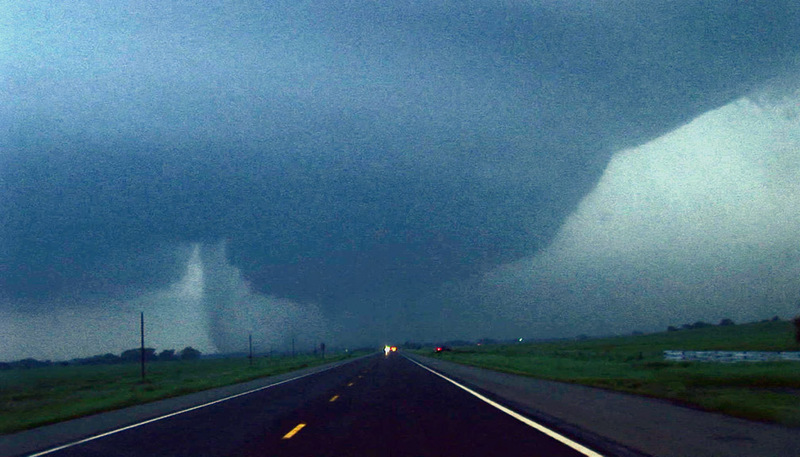 I talked with other chasers including Charles Edwards and Tim Vasquez. Everybody had different strategies. Finally, I decided upon the Hebron area. As I drove north, I checked additional data and shifted to Grand Island as a nice compromise. I still also liked northwestern Kansas but had more concerns about moisture. Being on the interstate, I could easily shift positions if necessary. There was a tongue of moisture pushing northward into central Nebraska with localized backing of surface winds due to the low. Upper level support was good. 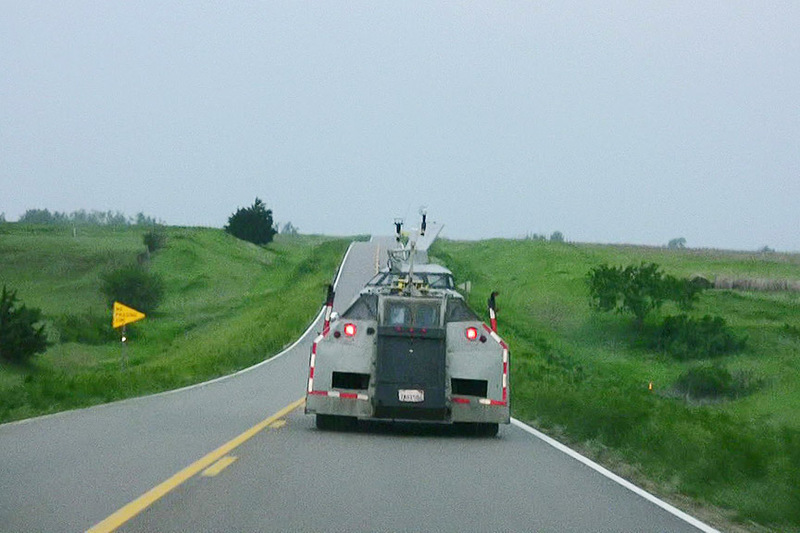 I arrived at Grand Island in early afternoon and joined the growing chaser convergence. Charles Edwards arrived a bit later with his tour group, Cloud 9 (1P, image of Mike Theiss and two of the participants on Cloud 9 Tours). I continued to monitor the conditions while doing some socializing. I met a lot of nice chasers (2P; Team Remora) along with seeing ones I already knew. By 1:55 PM, the satellite showed a nice cumulus field to the southwest. A storm rapidly developed near McCook, Nebraska. I waited awhile longer checking data before leaving Grand Island and heading west on I-80. I wanted to make sure this storm would be the best one to target. I did see a tour group (not Cloud 9) pulled over by the highway patrol along the interstate. As I drove west, the storm intensified as it shifted northeastward into better moisture. I wanted to intercept it on 283 but a long stretch of 1 lane construction had slowed my progress. The supercell , still south of I-80, was blocking my initial south option. I turned south earlier at exit 248, then blasted west on winding dirt roads toward the storm (3P; 4:30PM). I could see an intermittent wall cloud. I drove about 3 miles west of 745 and watched the approaching storm. Road choices were difficult. I had to back track, then go south Road A. I followed the storm eastward along rutted dirt roads including 742. Keeping up was difficult as I splashed through muddy areas and avoided potholes. I fish-tailed several times as I plowed through standing muddy water. I later found mud covering the engine-block and the underside of the hood. The storm to the north was not a storm I wanted to core punch due to large hail. 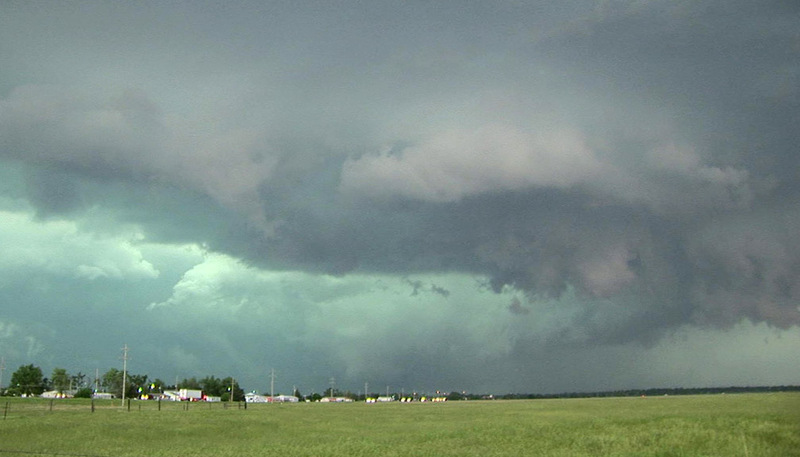 The wall cloud (4P)at 4:50PM was rotating. As expected, it intensified as it encountered the higher dewpoints. 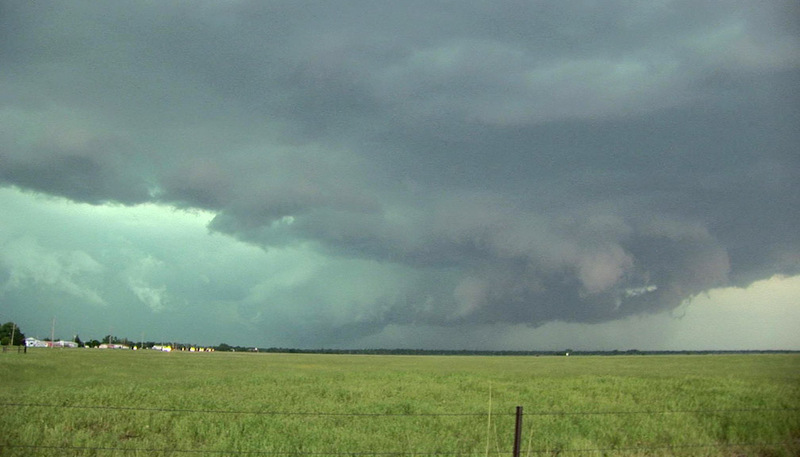 (Wall cloud at 4:56 near 183 (5P) and enhanced image (6P). I saw some dust under the wall cloud (7V) near 183 at 4:59 PM though it is unclear if I saw a brief tornado. I turned briefly north on 183. 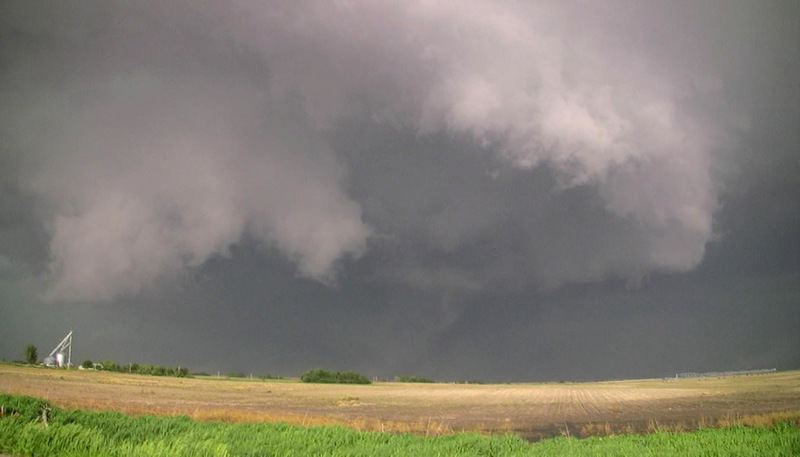 The wall cloud became elongated and almost funnel-like at 5:00PM (8V). It was due north. I had to continue east on 742 as I didn't have safe east options that were closer to the storm. 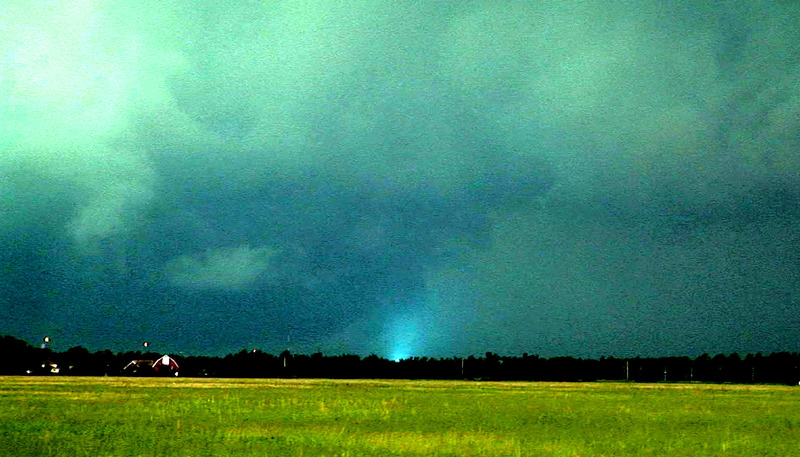 At times, I could barely see a rain-wrapped funnel to the north. I turned north again on 44 toward Kearney. The storm was almost north. At 5:25PM, I saw the first power flash under the main upraft of the storm. 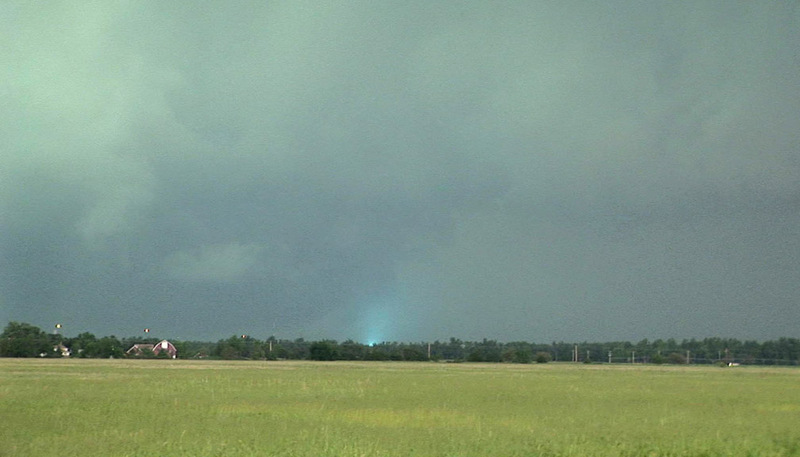 This is often the sign of a tornado that isn't otherwise visible. I could see a distant lowering and clear slot north toward Kearney (9V) at 5:28PM, but the tornado was difficult to visualize. I stopped south of Kearney on 44 and noticed Charles and his group nearby. We watched the edge of a large rain-wrapped tornado move through town causing more power flashes at 5:29 PM (10V) (and enhanced image (11V). 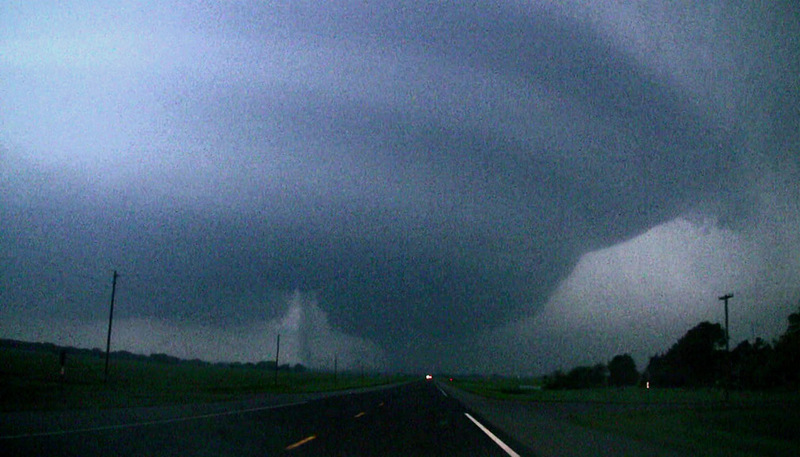 The tornado appeared as a faint bowl-shaped lowering or wedge. 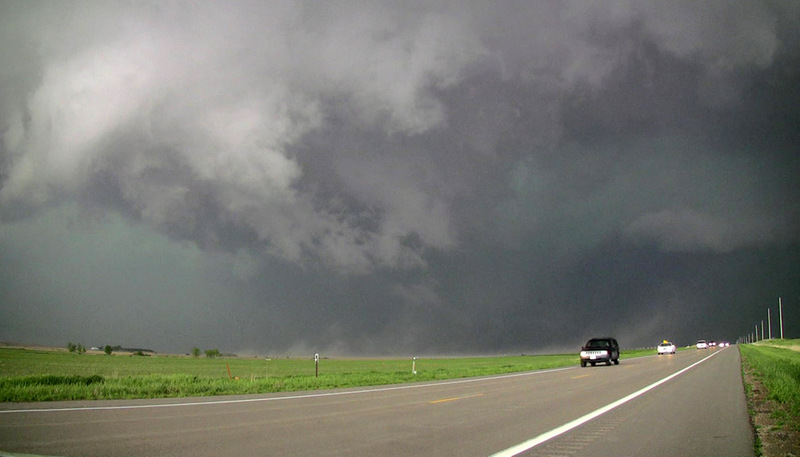 Visibility was terrible as the storm (12V) contined to move east of Kearney. I drove east behind Charles and his group who then turned north to enter I-80 just on the edge of the core. The storm was now moving along the interstate with new cores forming to the west. There were still tornado warnings including for Grand Isle but any tornadoes would be wrapped in rain. This was a big HP mess. Charles stopped at a gas station while I continued on I-80 watching the storms. According to Threatnet, there was a large isolated supercell in Kansas. Maybe I could reach the storm before dark. Map of my chase route near Kearney, Nebraska. 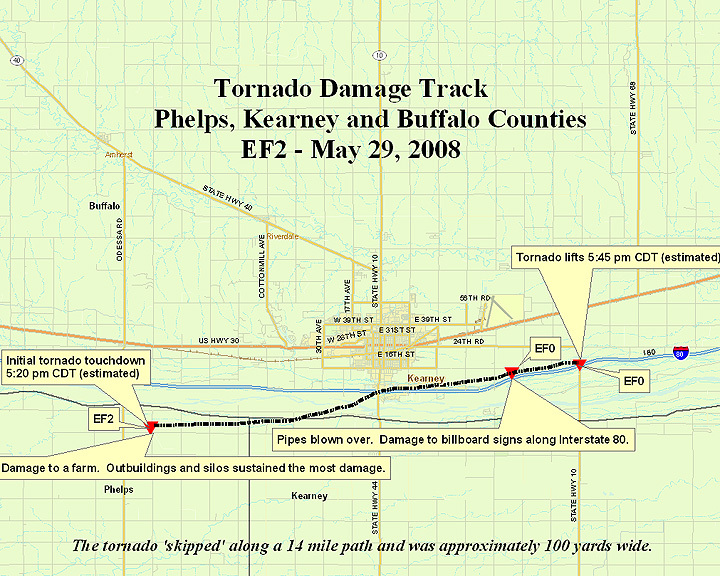 Hastings NWO May 29, 2008 Kearney area tornadoes info page. I blasted south. 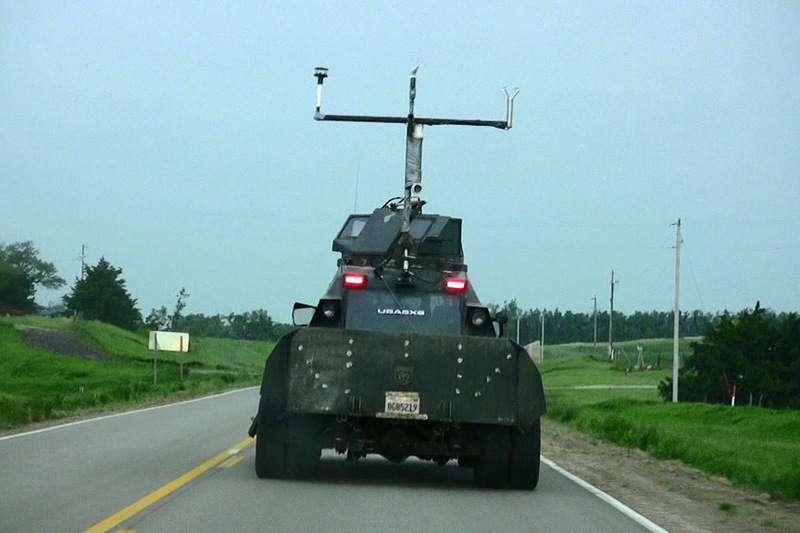 At one point, I got stuck between the new	(TIV2 (2V)) and the old (TIV1 (1V)) tornado intercept vehicles along with their entourage and the Doppler on Wheels. They were also going south. I didn't know the DOW could move so fast. As I neared the Kansas town of Beloit, I noticed a low tire pressure warning for the right rear tire. 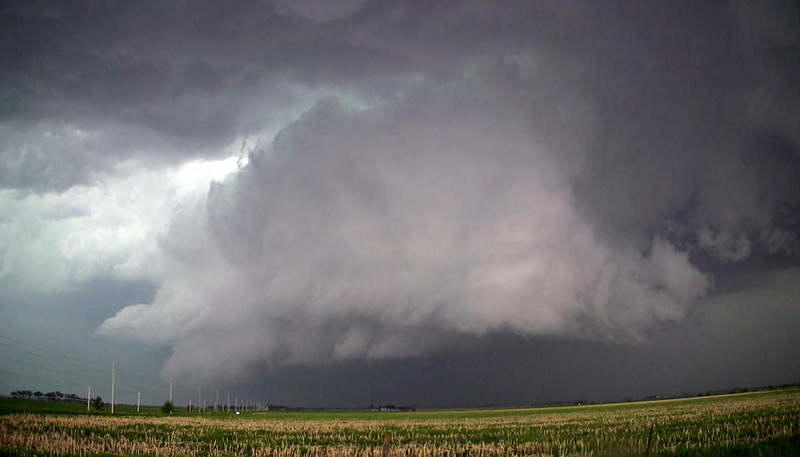 The massive supercell was rapidly approaching Beloit from the west. If the storm took a right-turn, Beloit would be hit. 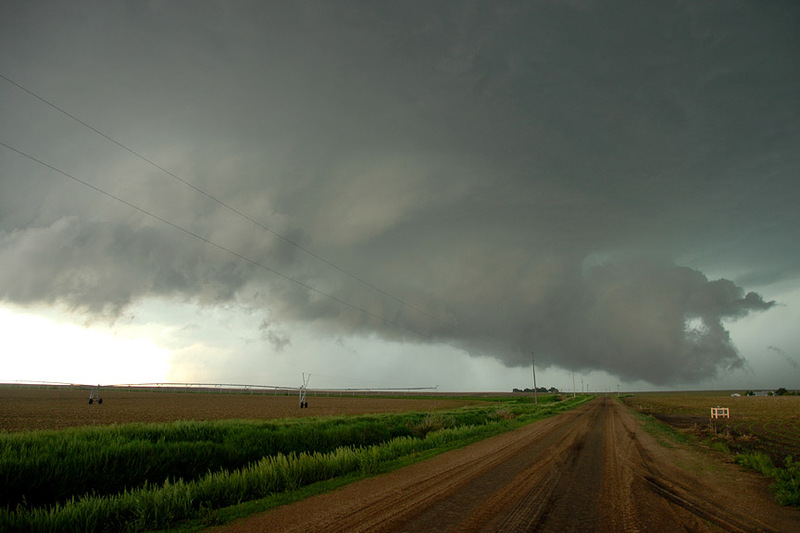 There were already reported tornadoes to the southwest with this storm. I checked the tire at a Beloit gas station while refueling and I saw a big nail was sticking out of the side wall. Arrghhh!! There wasn't enough time to change it. I put some air in the tire and it seemed to be holding. I didn't attempt to move the nail. I carefully drove slightly to the west. I didn't want to get too close to a tornadic storm with a damaged tire. By 8:35 PM, I could the massive storm towering into the sky. 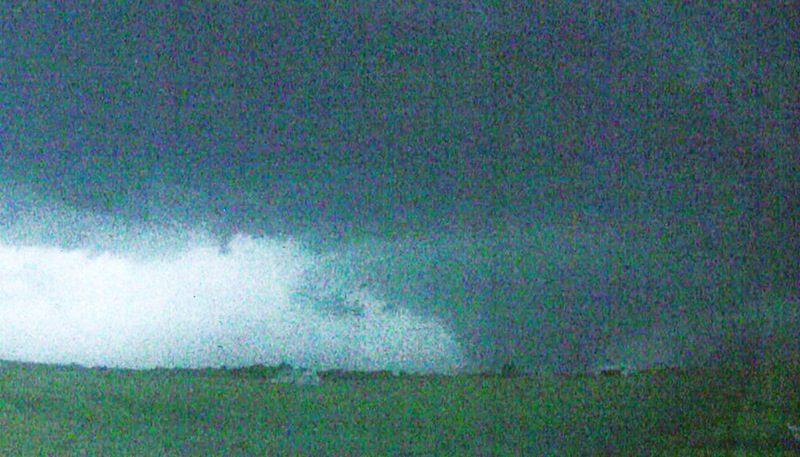 The whole storm (image at 8:40PM; 3V) was visibly rotating. The storm structure was incredible. I could see a faint wall cloud with intermittent tornado touchdowns (8:45PM; 4V) but it was too far away and dark to see much detail. 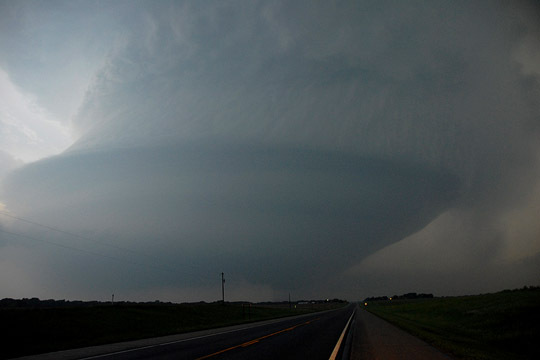 The whole storm was similar to idealized drawings of supercells in textbooks. This was amazing. Lightning (8:46PM; 5V) bolts shot away from the huge storm. I shifted slightly more west since I could easily see the storm's movement. I really wanted to speed west but that would be too dangerous. Air was still leaking from the tire. I was also in awe at this massive rotating cylinder towering into the sky. I took a few pictures but there were too many nearby lightning strikes to set up a tripod. 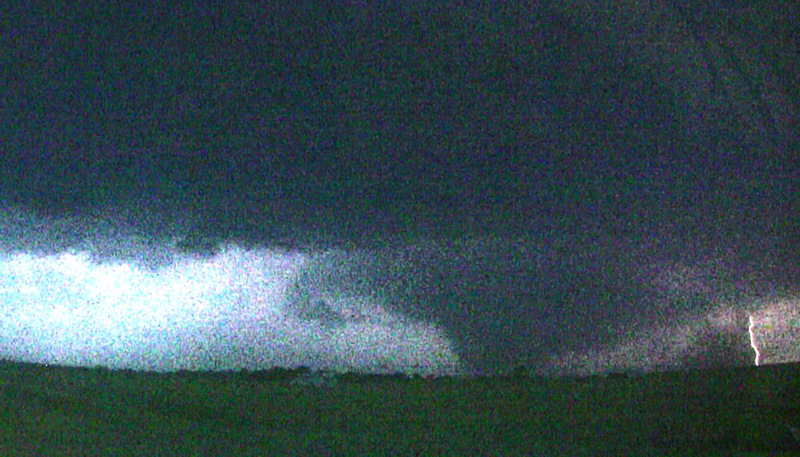 At approximately 8:46 PM, the tornado crossed the highway to my west (6V). (Another image of the storm and visible funnel at 8:46PM (7V) and just north of I-80 at 8:47PM (8V). The tornado seemed to lift, but then I saw a wedge forming (8:52PM; 9V) in the growing darkness. 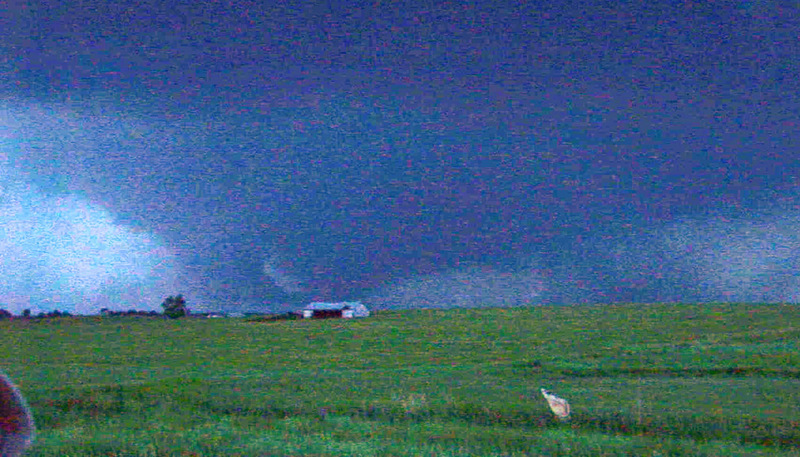 The tornado (10V) was northwest of my position at 8:53PM (another image at 8:53PM (11V). 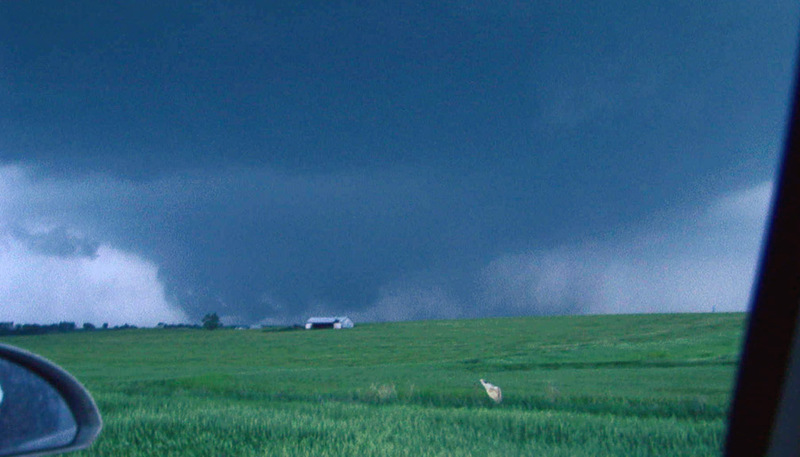 The wedge tornado (12V) was enlarging as it moved away into the darkness. I am glad the storm didn't hit Beloit but other towns were damaged in the supercell's long path. By then, it was too dark to film, and I really was uncomfortable with the tire. I slowly made my way back to Beloit and changed the tire. Air was now leaking at a greater rate. I stayed around for awhile and ran my radar for some locals including a very nice rancher who lived north of town. Finally, I slowly drove east and south towards Wichita. Speed was limited on those small spare tires. (west of Beloit) by the Hastings NWO. 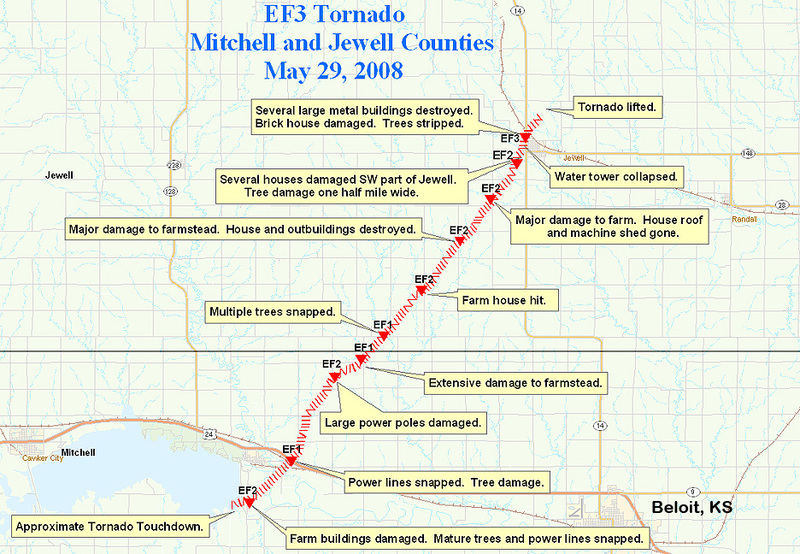 Hastings NWO May 29, 2008 tornado info page for that area. This was an awesome chase and a great way to end my chase vacation. Although I didn't have close views of the tornadoes thanks to a large nail in one of my tires, I did see an amazing supercell from a distance that allowed me to appreciate the entire storm structure. 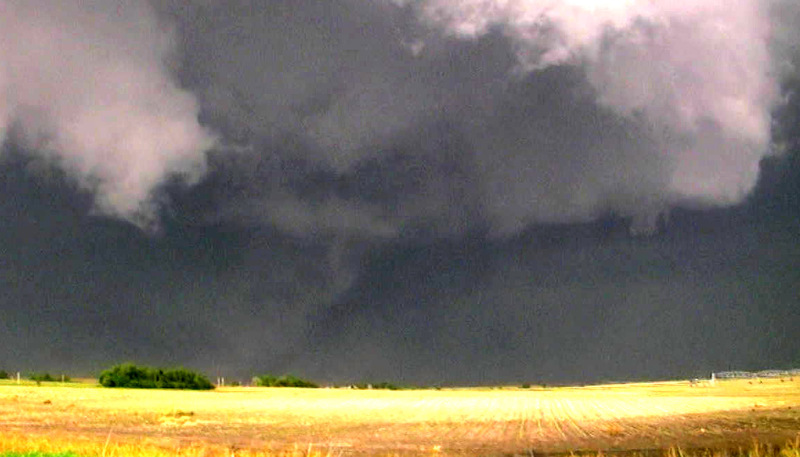 I saw at least three tornadoes from this storm and possibly one from the Kearney storm. 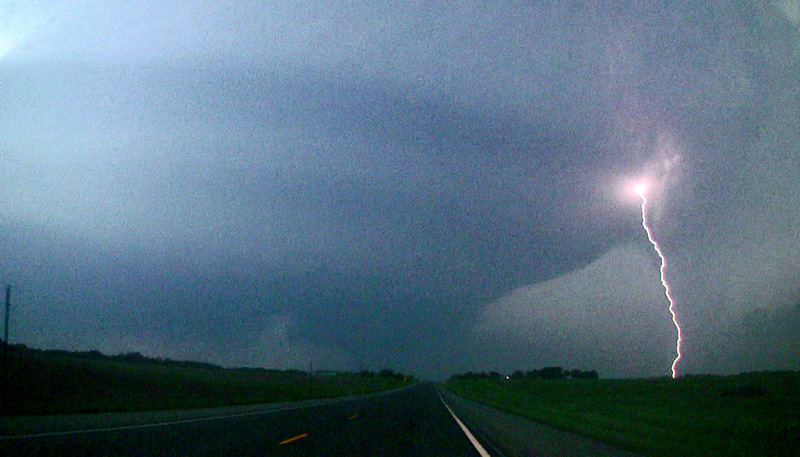 The darkness and distance makes an exact count difficult but it is the structure that most impressed me on this chase. Sadly, there was damage in Kearney, Nebraska and more extensive damage from the tornado that started west of Beloit near Glen Elder, Kansas and tracked into Jewell area. Congratulations to Charles Edwards who was able to maneuver his group to see close views of the tornadoes associated with the storm.